Home / Problem Sums Guide / 40 Must-Know Problem Sums (Volume 5) *For P5/6. The one BIG difference about this problem sums guidebook is it covers one of the MOST Challenging topical problem sums that many children and parents often face. That is Number Patterns. It comes with must-know tips and tricks on how to solve these problem sums – fast. The P5/6 problem sums are also getting tougher. We have compiled the more advanced problem sums so your child can have them at her fingertips. Over 17 types! 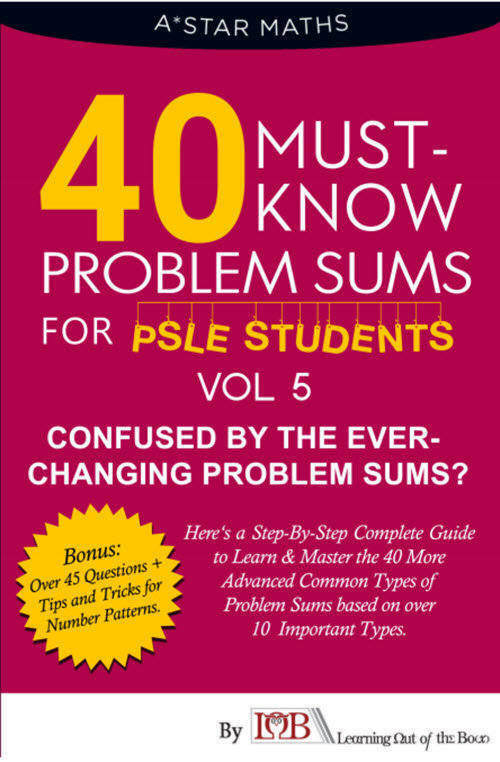 Here is our “40 Must-Know Problem Sums for PSLE Students Volume 5“. Many P5/6 children and parents have told us that Number Patterns questions and the advanced problem sums are getting more challenging.